Christina Singh (center) talks with Laura Leighton-Harris (left) and Kevin Kessler (right) at the New and Renew Church Planting Conference. When I first heard about the Church Planting Conference of our denomination, it did not sound like something that would interest me. But two words in its tagline caught my attention: Revitalize and Grow! Fixated on these words, I decided to attend. For two years, I have gone into the community around our church to spread God’s word but have found little success. There is so much potential and so many unchurched people around us, so I have felt the burden to approach them and introduce them to Christ. Going to the New and Renew Church Planting Conference, I was determined to get the most out of the experience and to learn information relevant to my community, to the church in a small town where God has placed me. The workshop that helped me most was “Decoding your Community” by Ryan Braught, who planted the Veritas Community Church in 2009 in Lancaster, Pa. This two-part workshop moved me into action and gave me insight and tools as to how we, as a church, can successfully do God’s work in our community. “Paul then stood up in the meeting of the Areopagus and said: ‘People of Athens! I see that in every way you are very religious. For as I walked around and looked carefully at your objects of worship, I even found an altar with this inscription: to an unknown god. So you are ignorant of the very thing you worship—and this is what I am going to proclaim to you’” (NIV, emphasis added). After the New and Renew Conference, I shared what I learned with members of our church board and commission team. Now we have a great vision and plan for our church to serve the community, revitalize, and grow. Together we will work to carry out the great commission. Find video recordings and find photos from the 2018 New and Renew Church Planting Conference at www.brethren.org/churchplanting. Worshiping together at the New and Renew Church Planting Conference. The conference theme, “The Risk, and Reward of Embodying Jesus Locally,” was based on John 1:14. 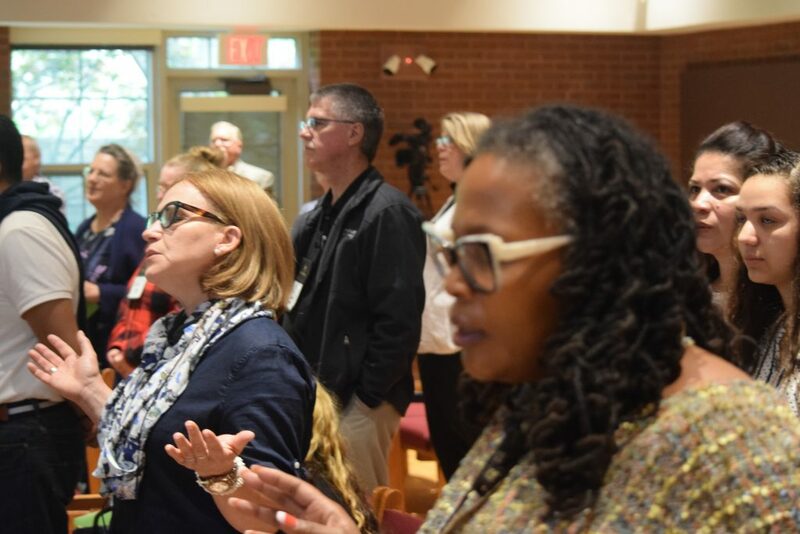 The event provided the space for participants and presenters to share about the challenging and rewarding work of planting a new church, explore ways to be the dynamic presence of Christ in their local community, and offer testimonies of God’s faithfulness. Another highlight at the event was seeing these pioneering, planting leaders as the embodiment of potential for multicultural diversity within the Church of the Brethren. Several church planters at the conference recently started Hispanic churches, including new projects in Los Banos, Calif. and Las Vegas, Nev.
Diversity could also be identified by the variety of new churches. One planter initiated a project in the Baltimore metropolitan area and it has become a growing multicultural church in just a year. Another leader in Chicago is pioneering a ministry that is extending the reach of their faith community into new places in their local context and also around the world. Another planter is pioneering the renewal of a congregation by connecting it to a startup ministry on a college campus. The United States today is composed of a multitude of nationalities from every corner of the globe. Few other areas of the world bring together such varied ethnicity. And while all people groups retain some measure of their own historical identity, they also create unique subcultures as they become part of the ever-changing culture of North America. As a result, the Church of the Brethren faces exceptional ministry opportunities that hold the promise of transforming countless lives through the gospel of Jesus Christ. The opportunities require fresh, creative approaches. These pioneer leaders, who are planting new churches and renewing established congregations, have a passion for seeing God glorified among those who are spiritually apart from the gospel of Jesus. Discipleship Ministries of the Church of the Brethren, formerly known as Congregational Life Ministries, values the relationship with these pioneers who seek to care for their community as an extension of their call and passion to fulfill the Great Commission. Discipleship Ministries walks along these pioneers through coaching, training, and fostering relational networks. Thank you for giving to further these ministries of the Church of the Brethren. Your prayerful and financial support of these ministries sustains these men and women as they serve God and their communities. Together we can celebrate the faithfulness of God as people discover Christ’s love and another way of living. Learn more about Discipleship Ministries at www.brethren.org/discipleshipmin or support them today at www.brethren.org/give .